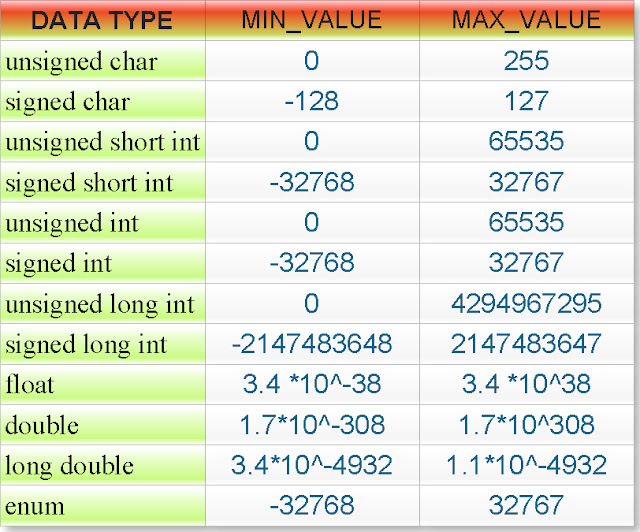 Following table illustrate the range or maximum or minimum value of data types in TURBO C++ and Borland c++ compilers. Note: In the above table range of float, double and long double has written only for positive numbers. But this range is also true for negative numbers i.e. for range of float is -3.4*10^38 to -3.4*10^ (-38) and so on. Interview Question: Why range of signed char is -128 to 127 not -127 to 128? -128 to 127, bcoz 0 also itself is a +ve. But if u sey range is "-127 to 128"
NO NEED FOR SO MUCH FUSS AND COMPLICATED LOGIC..
Now one bit is reserved for sign ..
printf("%ld", test); // Why do i get 20864 as result? What's wrong? that half of the values from positive range and rest are negative..
why does data types have specific ranges?? i mean we cannot perform multiplication addition or any other airthmetic operations for large numbers. in that case we have to use either string or array data types. why the data types have only specified ranges?? This is the exact and best answer.This is what I was looking for.Thank you satish bhai! !